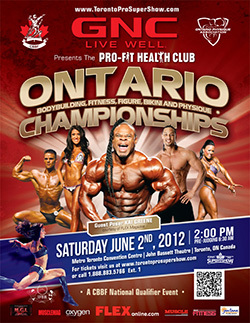 ← 2012 FAME Bodybuilding, Fitness, Figure & Model Central Championships This Weekend In Ontario! 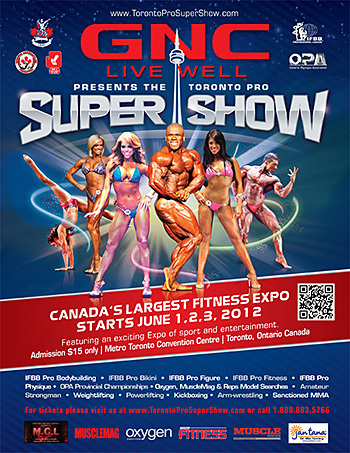 Canadian athletes, fitness models, bodybuilders and powerlifters, along with many from the northern U.S., will descend on Toronto, Ontario the weekend of June 1-3, 2012 for the 2012 Toronto Pro SuperShow. And SuperShow is no exageration – Not only is the Toronto Pro show the only IFBB Pro Show in Canada, but the event includes a number of other shows, competitions and model searches over the weekend too! So just what all is going on that weekend? With all of that going on in Toronto over 3 days, you’ll have to pick and choose which events you’ll attend, so be sure to check out the venues & times, and get your tickets, from the Toronto Pro SuperShow website. 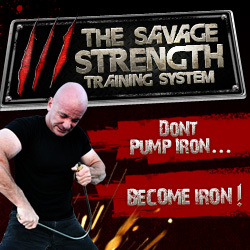 Advance tickets are available from their site until May 29th, 2012 – after that you’ll have to get them at the door. But be sure to check their sites for times and dates – not all events run all 3 days! Most of the events, along with the Expo, are being held at the Metro Toronto Convention Centre Exhibition Halls, plus some of the events are being held in the John Bassett Theatre, also inside the MTCC. One of the highlights of the OPA Provincial Championships will no doubt be Guest Poser IFBB Pro Kai Greene, who is always a crowd pleaser! Kai will be at the Flex Magazine booth the rest of the weekend, so be sure to stop by & say Hi to ‘The Predator’! But Kai is far from the only world-famous pro bodybuilder who will be in attendence at the Toronto Pro Supershow… IFBB Pro Ben Pakulski will be at the ALLMAX Nutrition booth on the Friday & Saturday, signing autographs for the fans. 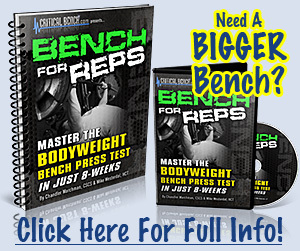 And if you’re at the SuperShow Expo on Sunday, June 3rd, be sure to have your camera along – for the first time ever in bodybuilding history four Legends of the Olympia – Ronnie Coleman, Jay Cutler, Dexter Jackson and reigning Mr. Olympia Phil Heath – will be signing autographs and meeting their fans at the Toronto Pro SuperShow EXPO on Sunday, June 3rd, 2012. And, as always, the fitness & bodybuilding women will be front & center too – Tosca Reno, author of the best-selling Eat-Clean Diet® book series, will be hosting seminars at the EXPO, while Canada’s first-ever IFBB Bikini Pro, Leigh Brandt, will be greeting her fans at the Inside Fitness Magazine booth. For those more into the visual aspect of fitness, be sure not to miss the Oxygen Magazine Fitness Model Search, the MuscleMag Bikini Model Search and the first Reps! Magazine Men’s Fitness Model Competition. Definitely more powerful reasons to have your camera along! For the fans and spectators this event really is off the hook – no matter what end of the fitness, bodybuilding, powerlifting, strength or fight worlds you follow, the Toronto Pro SuperShow is the biggest can’t-miss event of the year in Canada. In fact, if you’re in Boston, New York, Chicago or Washington, DC, there’s no reason to miss it either – Porter Air offers cheap flights between those cities and the Toronto Island Airport, which is right downtown just a short cab ride from the Metro Toronto Convention Centre. So head over to the Toronto Pro SuperShow site now to check out the schedules, find your favorite events and get your tickets – don’t wait for YOUR event to sell out! And be sure to get your tickets for the EXPO as well – not only will all those big names be there, but there are some incredible deals to pick up from the 150 booths there… Enjoy the show! 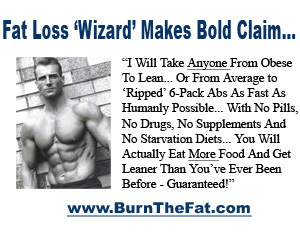 This entry was posted in Events & Competitions and tagged athletes, bikini, bodybuilding, bodybuilding news, competitions, fitness, fitness news, models, physique, powerlifting, strongman, Toronto fitness show, Toronto Pro Bodybuilding Show, Toronto Pro SuperShow, weightlifting. Bookmark the permalink.